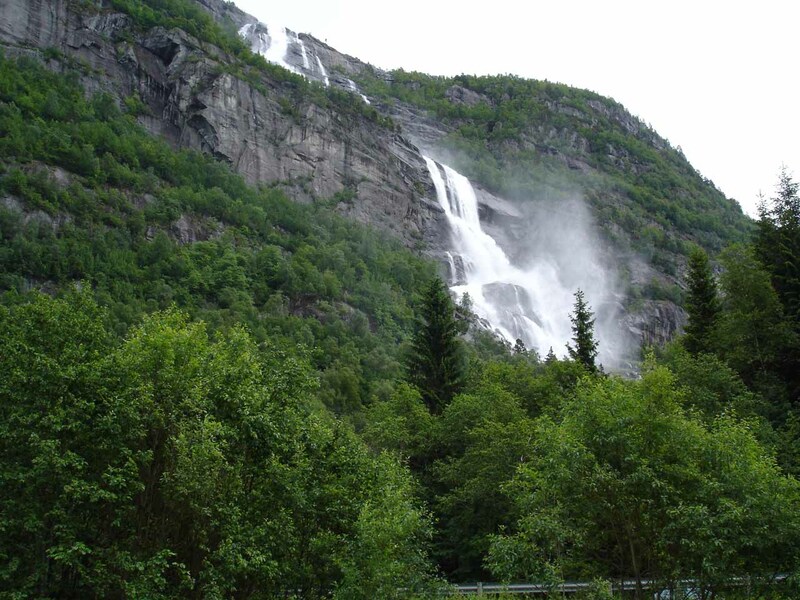 Strondsfossen was the fourth waterfall we encountered while driving through Oddadalen north towards Odda. 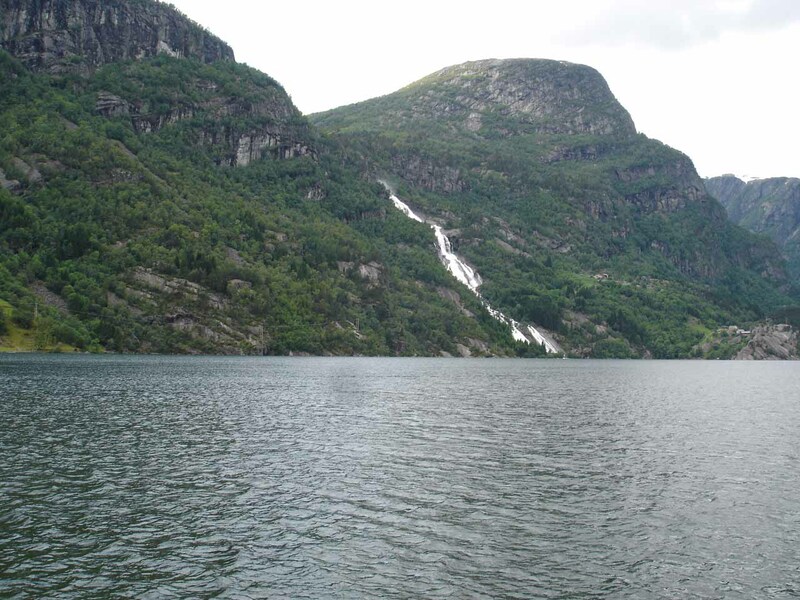 With so many huge waterfalls here, any wonder why they call the Odda Valley the “Valley of Waterfalls”? 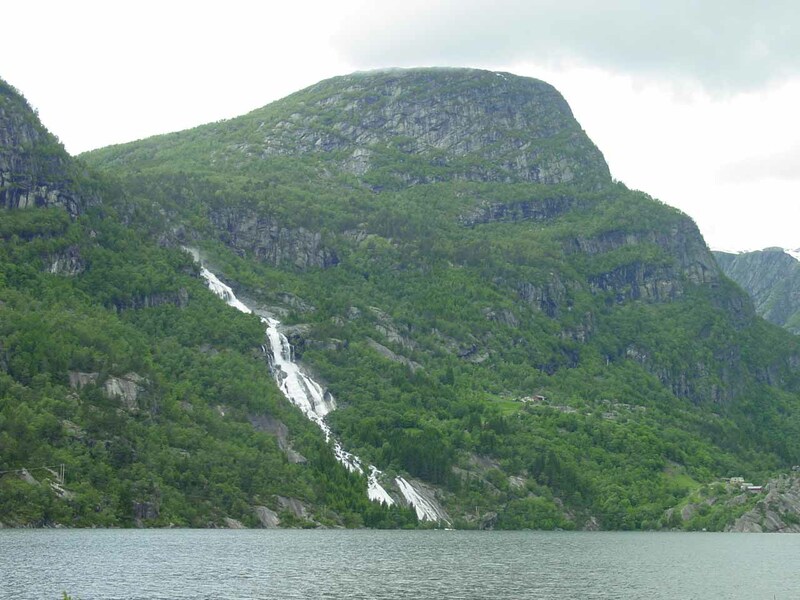 This attractive waterfall stood out to us because its twisting flow was situated right across the beautiful lake Sandvinvatn (or Sandvinvatnet [“SAHND-vin-vaht-nuh”] if you include the definite article; also seen it spelled Sandvevatnet) on its western shore. 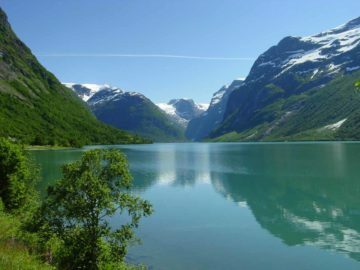 And since it was tumbling down the western wall of Oddadal Valley, its waters were sourced by several lakes and tarns. 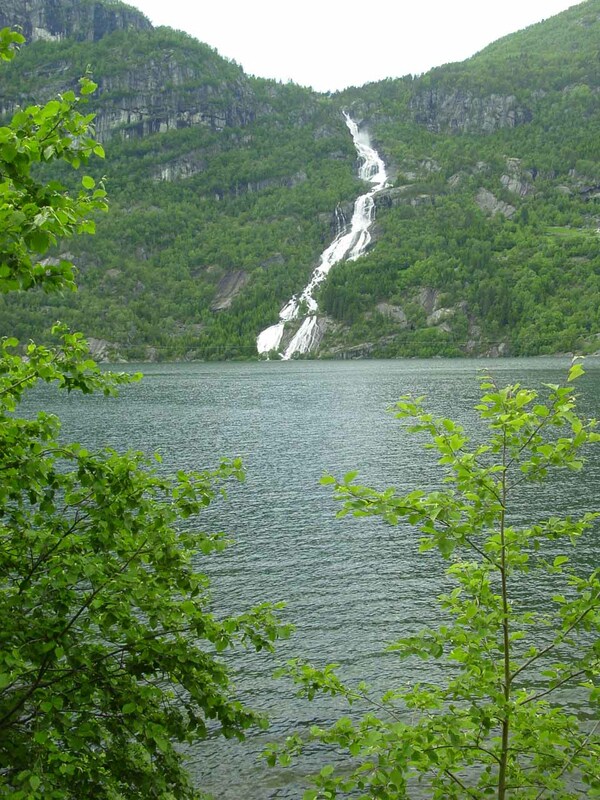 Like other waterfalls in the valley’s western wall, the lakes and tarns themselves were sourced by a combination of precipitation and the meltwaters of the Folgefonna Glacier. 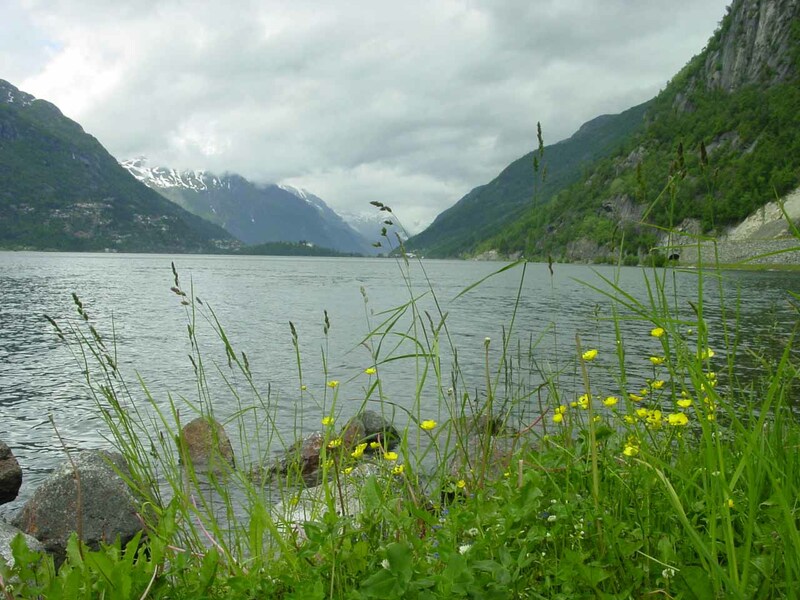 There were some wildflowers blooming on the shores of the lake, which added a bit of color to the landscape contrasting from the gray and overcast day of our visit. In addition, we were easily able to experience this waterfall from the roadside (see directions below). 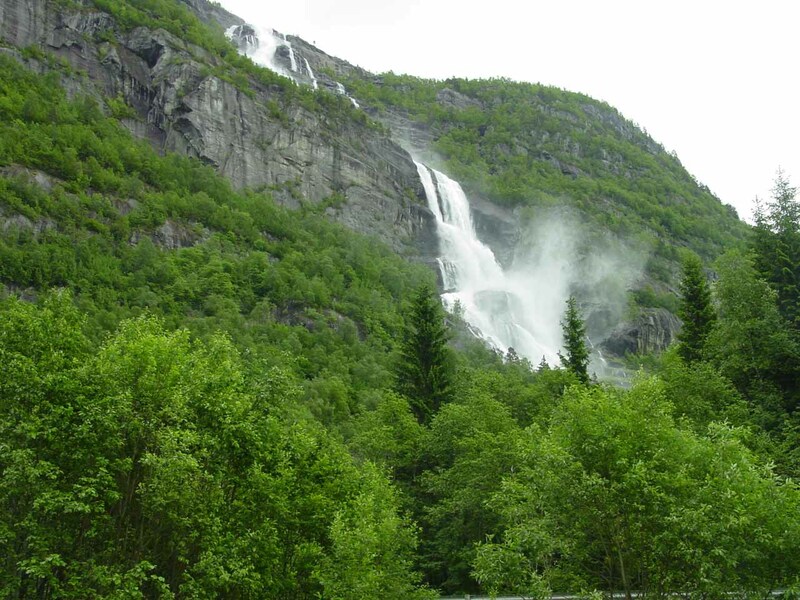 We noticed there were some houses or buildings dwarfed by the allegedly 500m tall waterfall so there might be other ways to experience the falls or to drive closer. 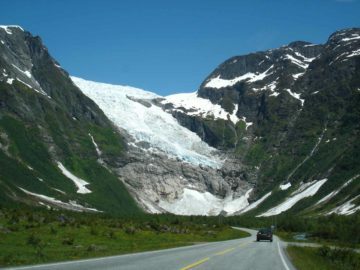 However, we can’t be certain about that since we were content with our roadside views (which you can see in the photos on this page). After being done with one of the roadside views, as soon as I turned around and headed back to the car, I was surprised to see another waterfall way up on the east side of the valley. 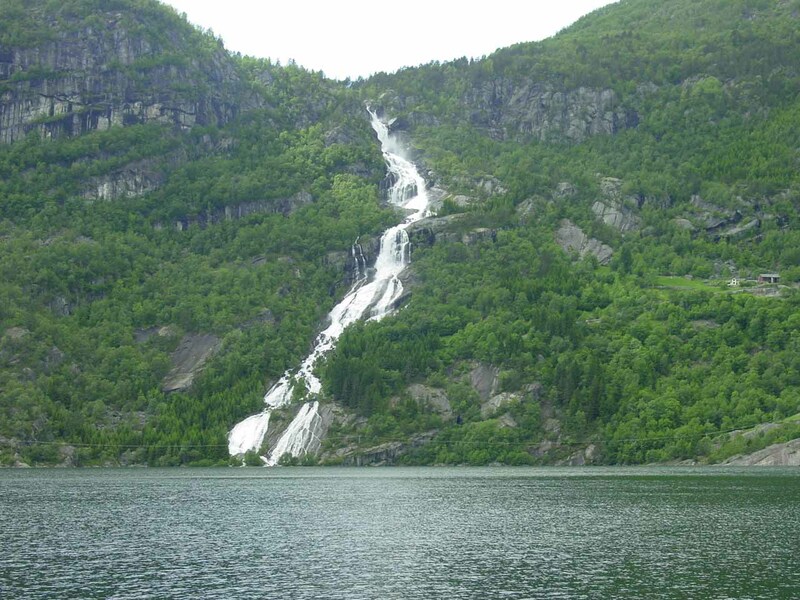 That other waterfall happened to be Tjørnadalsfossen. 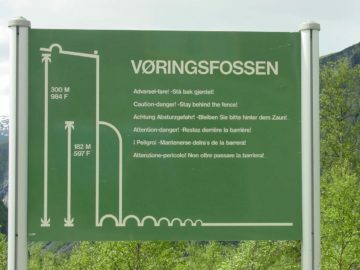 Given how it was noticed only after getting out of the car and looking around, I’d imagine that this falls would be very easy to miss! 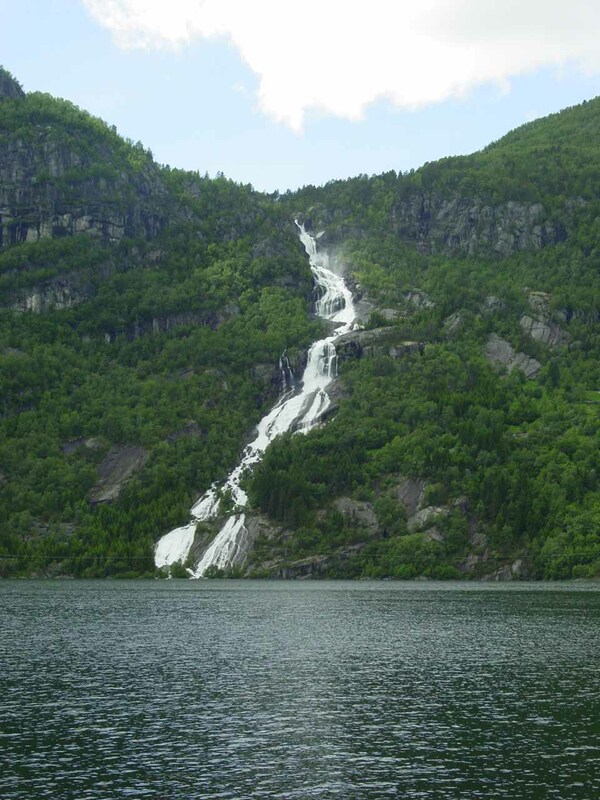 Finally, I also noticed in Norgesglasset that this waterfall might also be referred to as Strandsfossen (The Shore Waterfall?). 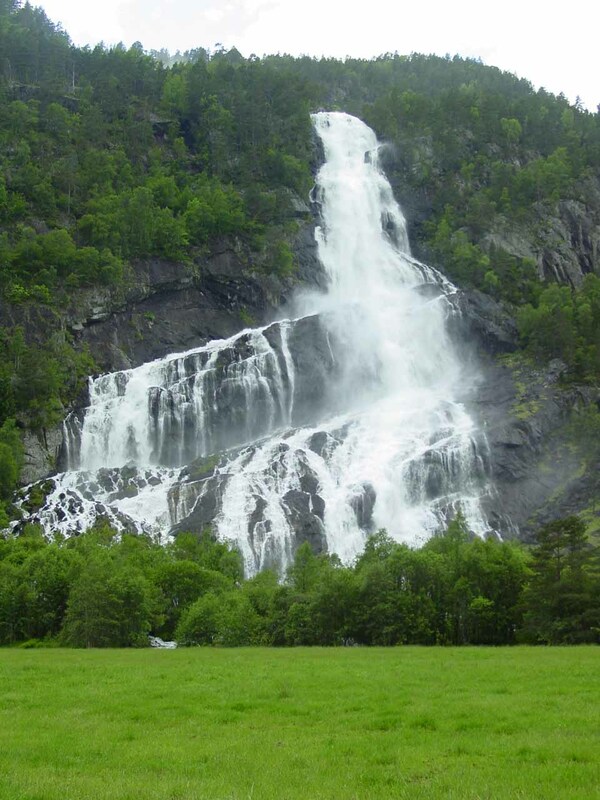 Indeed, it seemed like many of the waterfalls in Norway had different spellings or multiple names. 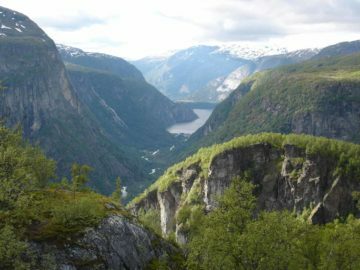 Strondsfossen resides in the Odda Municipality. For information or inquiries about the area as well as current conditions, visit their website or Facebook page. From Rv13, we were able to see the falls from various angles across the lake. However, there was a spur road that led towards the lake leading to a wide open area where we were able to get out of the car and take photos. 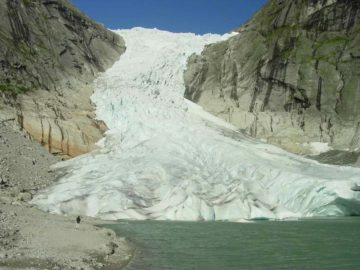 We stopped roughly 4 or 5km north of Vidfoss. 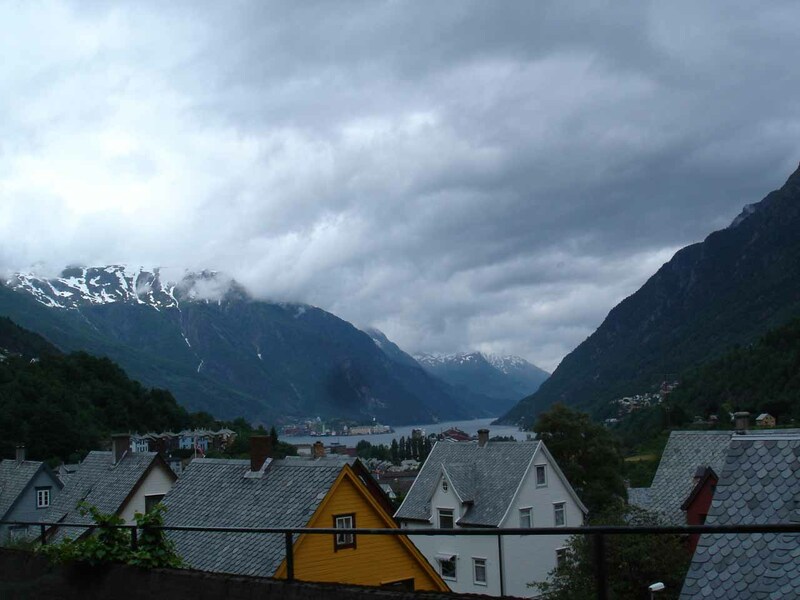 It’s also roughly 5km south of Odda.